It didn’t take much for Jesuit priest Theodore “Ted” Zuern (1921-2007) to recognize he was drawn to a life of preserving Lakota culture, art, and heritage. In 1969, just one year after he became Red Cloud Indian School’s president, Fr. Zuern invited local Native artists to display their work on campus, sharing their talent and vision with the community. With that small exhibit, the Red Cloud Indian Art Show was born. Nearly 50 years later, it has established itself as the nation’s largest and longest running Native American art show of its kind. In doing so, The Heritage Center has become a trusted advocate for Native arts and amassed one of the nation’s most significant collections of Native art in the country, stewarding over 10,000 pieces from tribal artists across North America. Next month, in honor of Fr. Zuern’s legacy, his alma mater—Marquette University—will host an exhibition featuring 21 priceless pieces from The Heritage Center’s permanent collection. Lakota Voices: Collection Highlights from The Heritage Center at Pine Ridge Indian Reservation juxtaposes the individual creations of historic Lakota artists with the work of contemporary Lakota artists, inspired by and in dialogue with traditional art forms such as buffalo bonnets, ledger drawings, and embellished buffalo horns. It also explores the longstanding relationship between the Jesuit and Lakota spiritual traditions that have shaped Red Cloud Indian School’s history. The exhibit will be on display at the Haggerty Museum of Art on Marquette’s campus in Milwaukee, Wisconsin—Fr. Zuern’s birthplace—from February 2 through May 21, 2017. For Mary Maxon, The Heritage Center’s director, recognizing Fr. Zuern’s contributions is a fitting way to anticipate celebrating 50 years of the Red Cloud Indian Art Show. As a young Jesuit in training in the 1960’s, Fr. Zuern became a teacher on South Dakota’s Rosebud Reservation and immediately recognized how deeply art was entwined in Lakota culture and spirituality. He believed the Native people he served were all artists and said that “the best way to describe them is ‘poets’.” Above all, he recognized the many ways that Lakota culture and spirituality had been dismissed and suppressed. Years later, as president of Red Cloud, he adapted the school’s curriculum to include and celebrate Lakota art, culture, and language, and students began to thrive in a new way. It was at that time that he launched the Show. Today his legacy lives on: the Show has helped to further the careers of some of the most prominent Native artists working today, including Donald Montileaux and Dwayne Wilcox, whose work will be on display at the Haggerty Museum of Art. With Marquette’s deep Jesuit roots, the entire team at its Haggerty Museum of Art was thrilled to have a chance to honor Fr. Zuern’s legacy—and to highlight the extraordinary work in The Heritage Center’s collection. Director and Chief Curator Susan Longhenry worked closely with Maxon and The Heritage Center’s Curator Ashley Pourier to pair historic and contemporary pieces that reflect the unique characteristics of both traditional and modern Lakota art. The resulting exhibition is a stunning collection that illuminates the experiences and perspectives of Lakota artists over more than a century. In developing Lakota Voices, Longhenry gravitated toward pieces that illustrate that longstanding relationship. 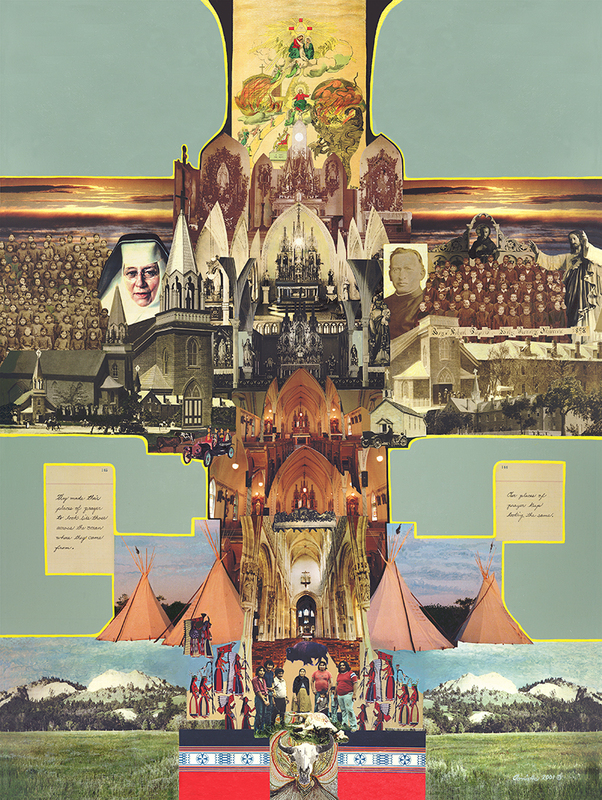 One of her favorites, Holy Rosary Mission by Arthur Amiotte, is a collage that uses images from the Catholic faith and Lakota culture to create the shape of a cross. In addition, Longhenry created an interpretive exhibit to provide visitors with essential context for understanding the art on display. Through photographs from Red Cloud’s historic archive—which is based at Marquette—she developed an illustrated timeline that will run along nine-feet of one wall in the gallery, highlighting key moments in Red Cloud’s 129-year history. She also included text and images honoring Fr. Zuern’s work on reservations and the role he played in supporting contemporary Lakota artists. 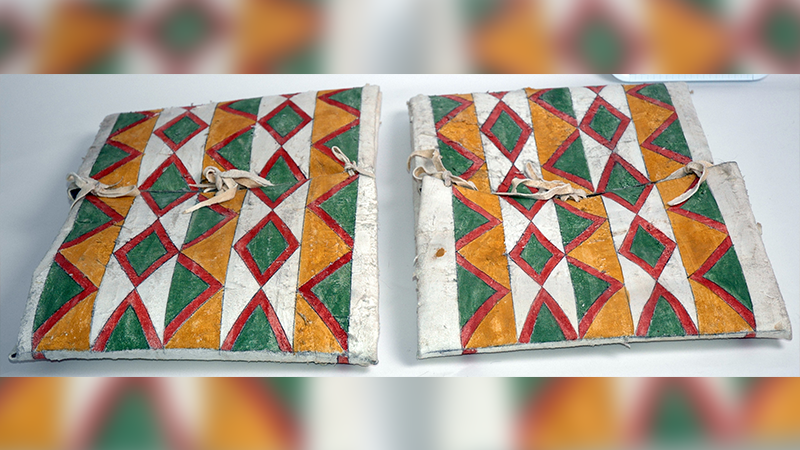 The Heritage Center’s curator Ashley Pourier was thrilled to work alongside Longhenry to identify pieces from the permanent collection to include. And she says this relatively small exhibition represents a true visual cross-section of Lakota art over time. By deliberately pairing historical pieces with contemporary work, Longhenry, Maxon, and Pourier created an exhibit that speaks to the resilience of the Lakota art, culture, and spirituality over centuries of change. Longhenry hopes that Lakota Voices will help to educate visitors about the issues facing the Lakota people today.